Former British Prime Minister Tony Blair's recent statement that he was reluctant to speak about his religious faith while he was in office as he felt people in Britain might regard him as a "nutter" has stirred vigorous debate. 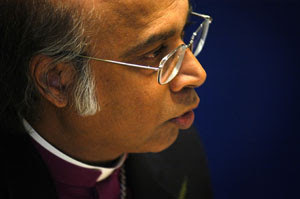 The Anglican Bishop of Rochester, Michael Nazir-Ali, said, "I am sorry that Tony Blair feels he could not talk about his faith in case people thought he was a nutter." The bishop was quoted by the BBC as saying, "A Christian vision underlies all that is important about Britain: its laws, institutions and values." Nazir-Ali added, "If Blair had been able to relate this vision to his policies, we would have had more constructive social policy at home and principled policies abroad." Blair acknowledged that his belief in God played a "hugely important" role during his 10 years as prime minister, in a BBC television documentary entitled "The Blair Years". "If I am honest about it, yes of course it was hugely important," the former prime minister said about his belief in God, in an episode to be broadcast on 2 December. "You know you can't have a religious faith and it be an insignificant aspect because it's, it's profound about you and about you as a human being". As prime minister, Blair led Britain to war in Iraq, but also helped bring peace to Northern Ireland after decades of conflict. "As I always say there is no point in me denying it, I happen to have religious conviction, I don't actually think there is anything wrong in having religious conviction - on the contrary I think it is a strength for people," Blair stated. He explained, "I mean if you are in the American political system or others then you can talk about religious faith and people say yes that's fair enough and it is something they respond to quite naturally". Blair added, "You talk about it in our system and frankly people do think you're a nutter." European Union trade commissioner Peter Mandelson, a minister in Blair's Cabinet said that religion was "very, very important" to the former prime minister who left his post in June. "This is a man who takes a Bible with him wherever he goes and last thing at night he will read from the Bible," Mandelson told the BBC programme. The programme reveals that Blair's ex-spokesperson Alastair Campbell warned Blair against going public on his beliefs. He said in the programme that his former boss "does do God in quite a big way", but that both men feared the public would be wary. The British media has long speculated that Blair, who is an Anglican, is likely to join the Roman Catholic Church to which his wife Cherie belongs. The Daily Telegraph newspaper reported that Blair came to faith after meeting the Rev Peter Thomson, an Australian priest, during his time at Oxford University.